A riding safari in Africa is a superb and exciting way to view Africa’s beautiful wildlife. The landscape and terrain is as varied as the animals ensuring that all abilities can be looked after, and there is always somewhere new to explore. 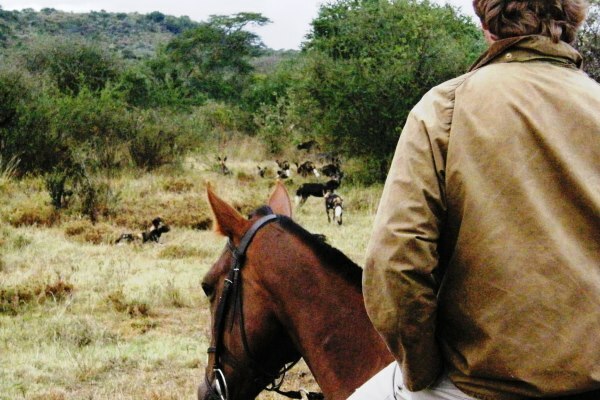 We asked five of Africa’s top riding safari guides five quick questions. 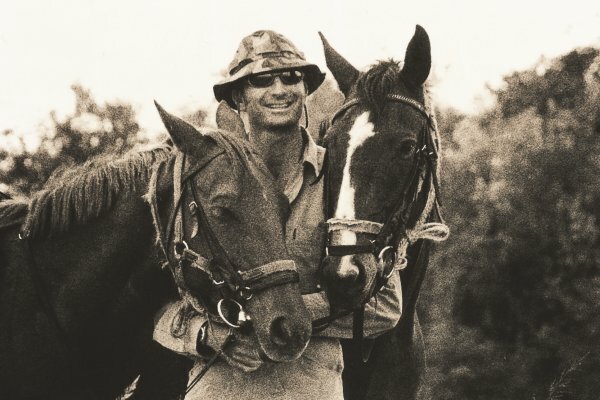 Born and brought up in Kenya, Gordie has spent most of his life in the bush leading riding safaris through the stunning conservancies bordering the Masai Mara and in Laikipia in the Central Highlands, a stunning region of Kenya renowned for its diverse and beautiful landscape and abundant wildlife. The Masai Mara always promises excellent wildlife viewing and this is taken to another level with the arrival of the herds of wildebeest during the annual migration between July and October every year. 1. When was your first time on a horse? My Pa, Tony Church, pioneered horseback riding safaris in Kenya and I pretty much grew up on a horse from childbirth. Back then our riding safaris were in The Great Rift Valley and in the early 70s, we also started the rides in the mighty Masai Mara. 2. What is your favourite breed of horse and why? Over the years I have led our rides in big game country on a variety of different horse breeds. However, in that time my favourite horses have been thoroughbred, thoroughbred-cross and now a Boerperd. I do not believe that it is the breed that makes the best lead horse, but indeed the individual horse’s character. 3. What is your favourite wildlife to see from a horse and why? 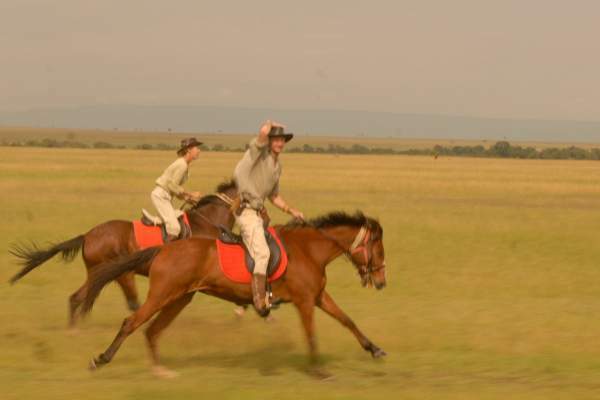 Riding in the Masai Mara, we are privileged to ride with a plethora of wildlife species, all day and every day. My favourite would be the wildebeest migration, elephant, buffalo and giraffe. Why? The sheer thrill of riding in wide open game country, the excitement that it brings and the joy of feeling my horse’s freedom. 4. What do you do on your day off? I fly-fish for rainbow trout in the Kenyan Highlands, teach my little daughter Miss Tyga Church to ride, sail on the Indian Ocean and ‘shake-my-leg’ at any parties in the district. 5. Do you have a favourite memory of riding in Africa? – Galloping through Hells Gate National Park at the age of nine, totally out of control, and loving every crazy moment of it. 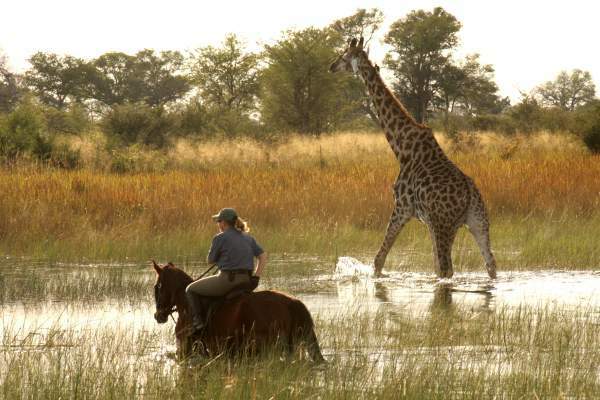 – Running with over 100 giraffe across the Koiyaki Plains, with the joy of guest and horse alike. – Falling in love with my wife as we rode countless miles with guests through Kenya. 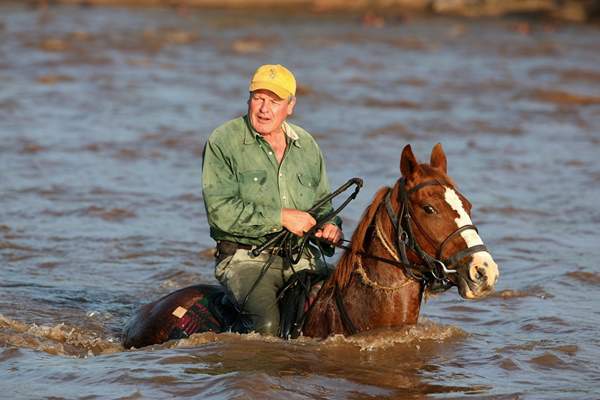 Barney learnt to ride as a child in Kenya and after that took formal training in England with the British Horse Society. 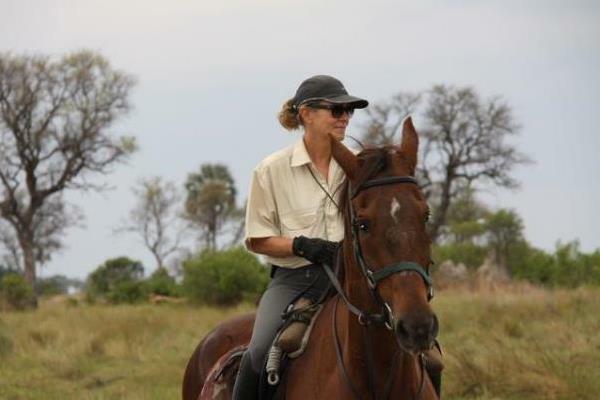 For the last 30 odd years Barney has been in the Okavango Delta in Botswana, leading riding safaris through this wildlife rich region, bringing young horses on and sharing her knowledge and passion for the area. I first rode a horse when I was four years old in Kenya, we lived in Nairobi and my parents took me to John Sprague’s yard, a race horse trainer, because they were tired of watching me ride the railings on the veranda. I have to admit I love thoroughbreds, they have a special way of moving and such spirit. However they are not easy keepers. Elephant; it is so thrilling to watch a relaxed bull pass within meters of you and totally accept you. Jump in the sea with a snorkel and swim with whale sharks off the coast of Tanzania, but I need a few days off to do that! Moving along with a breeding herd of elephant and watching their interaction when a pair of mating honey badgers caused havoc to the peaceful scene! Born and brought up in Laikipia, Simon returned to Kenya after finishing school in England and travelling through South America. He now spends his time at Sosian where he leads the riding safaris through the beautiful, and wildlife rich, Sosian Ranch. Five years old on a fat bush pony. Hanoverian X ….they are brave and spirited! African wild dogs. Riding up to, and alongside, Africa’s second rarest predator as it hunts gives the rider a rush like no other. The ease with which they accept the horses results in up close and unforgettable encounters. If it’s not galloping alongside packs of wild dogs as they chase down impala then it has to be watching a pair of honeymooning lions from 20yds. Born and raised in the Limpopo province of South Africa, Ant learnt to ride on his family’s cattle ranch. 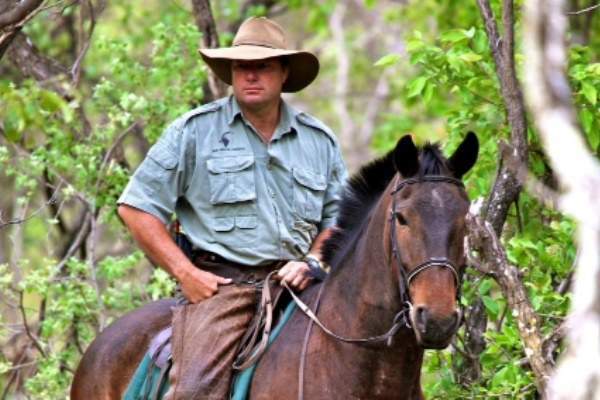 A passionate conservationist he saw a way to combine his love of wildlife with that of riding on this private reserve. With no lions on the reserve the horses are turned out with the plains game ensuring wildlife and horses are relaxed with each other. This also allows Ant’s Reserve to cater to all abilities of rider. My dad was a cattle rancher and the earliest recorded memories of being on horseback was sitting on the pommel of his saddle riding around the cattle when I was two years old on his thoroughbred mare called Flicka. Since that time I have always experienced a tremendous warmth towards horses. My two best horses have been crossbreeds where one of them being Friesian x Boerperd and the other a Morgan x Boerperd. They are 16hh and have good strong legs to carry my weight, broad hoofs and are super athletic and agile whilst having great stamina (from the Boerperd line). 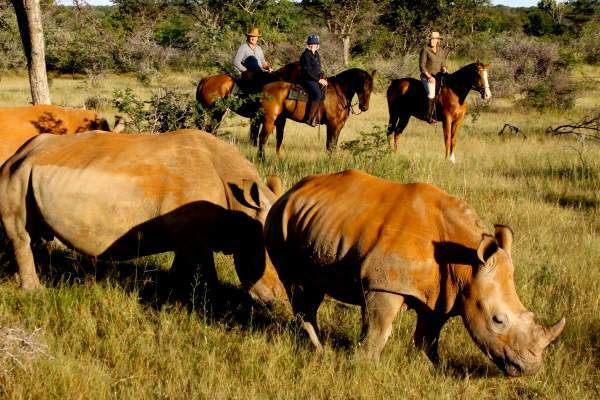 These horses are incredibly brave and steady, standing up to buffalo and rhino. I am a great believer in a comfortable canter and these horses are both incredibly smooth to ride and they have a strong proud head carriage. I enjoy riding close to rhino as they are such an iconic species that is so vulnerable and under threat now. One can get within meters of the rhino and they are totally accepting of the horses even cows with young calves at foot. Sitting on your horse as they graze right next to you is a great pleasure. When I have time off I enjoy exercising, being out on a mountain bike with my hound Ralph or time away fishing for tiger fish on the on the lower Zambezi river. 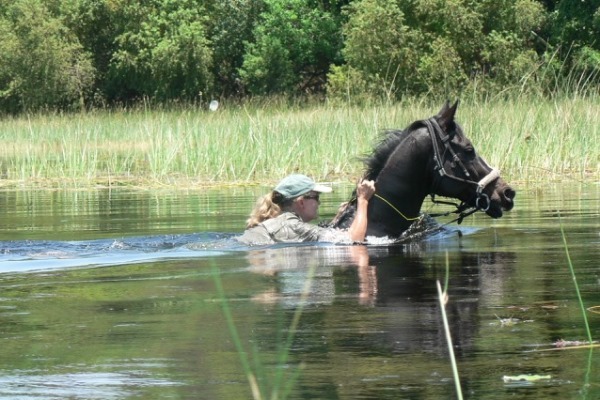 My most enjoyable memories are doing wildlife capture on horseback, where we dart the animal from a horse and then follow it until it goes down [Editor’s note: this allows veterinary work to be done or is for animal relocation]. There is very little stress to the other wildlife in area and it is very exciting and rewarding. The best being darting four buffalo bulls in five minutes. Born in South Africa, Tristan grew up in East Sussex where he first started to ride. After a six year stint in the British Army he returned to South Africa, by motorbike, working as he went. 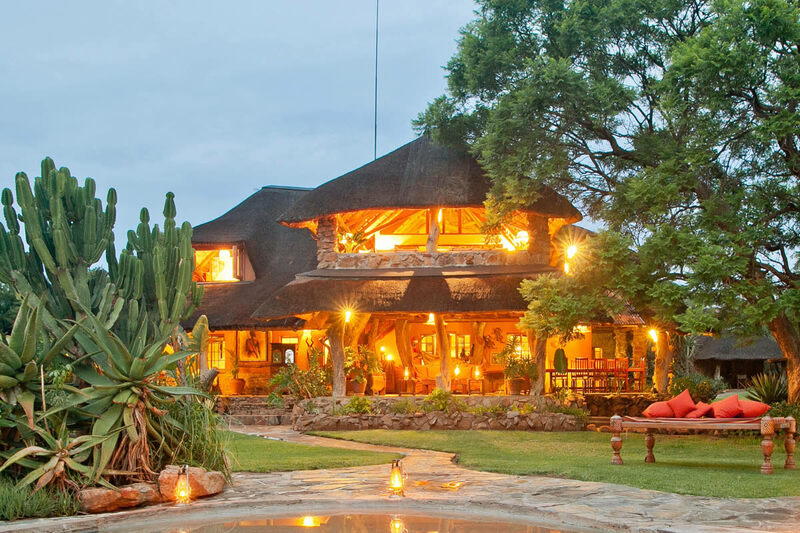 He settled in Kenya where he started Offbeat Riding Safaris in 1990. 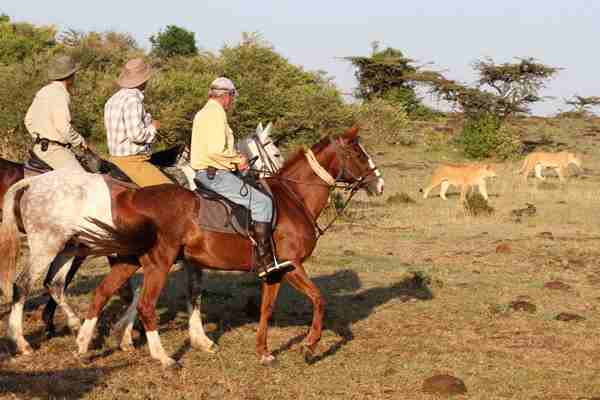 Tristan leads mobile riding safaris through the Masai Mara, Laikipia and Amboseli amongst big game. My first horse was a donkey at five years old whilst growing up on the South Downs in East Sussex. My favourite horses are thoroughbreds as they are incredibly versatile and good at multi-tasking. Our best thoroughbreds play in a 10 goal polo tournament, do novice events and ride up to a bull elephant without fear. 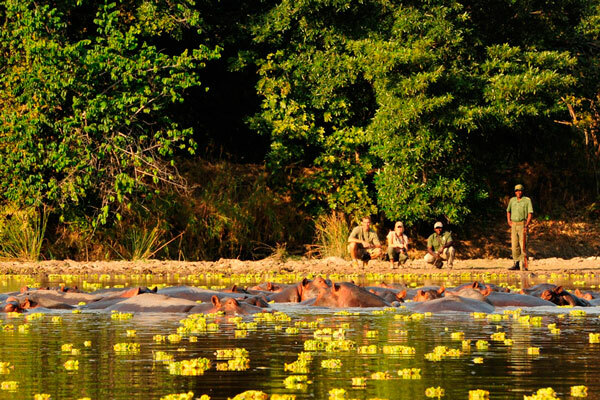 They also jump the “cross-country fences” that elephants create in the Mara. The Offbeat lion pride in the Masai Mara at Olare Orok have become habituated to horses over the last five years and 14 one year old cubs have grown up with horses around them. This is the culmination of 20 years of give and take, with some hairy moments, but is a wonderful feeling being so close on horseback. The horses are so relaxed too which is a real pleasure. I love to go on a riding holiday elsewhere in my spare time. The best moments are getting back to the Olare Orok at dusk on horseback and interacting with the 21 strong lion pride there as they begin their nightly prowl if we are lucky enough to meet them. If you’ve got this far and not found an answer to a question you have, or you think there’s something else we should have asked the guides, please ask in the comments section below, or pop us an email. We’ll be sure to reply and may amend the article to include our answer. 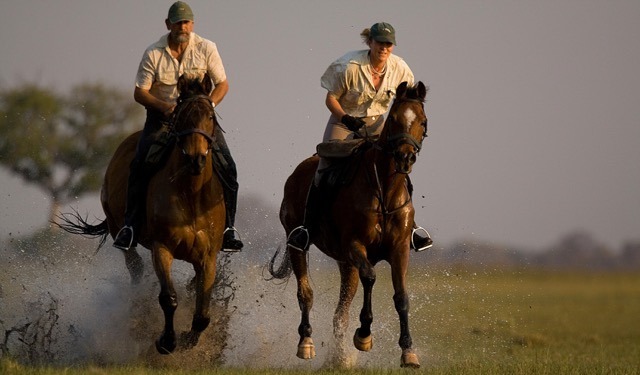 To see more photos, travel tips, riding holiday destination ideas, detailed riding safari itineraries, and more, have a look at our riding safaris page. 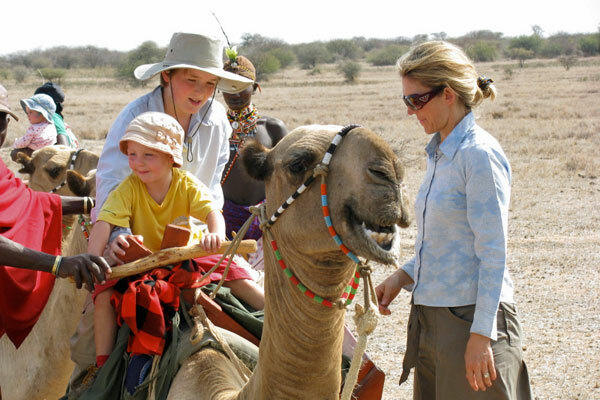 We would be delighted to help you plan a riding safari holiday, or answer any questions if you’re at an earlier stage. Please just send us an email or give us a call.